You finally did it – you made a budget and you’re working hard to stick to it and then bam! Your car breaks down, your spouse overspends, you start dreaming of that vacation you’re in desperate need of…and the list goes on and on. 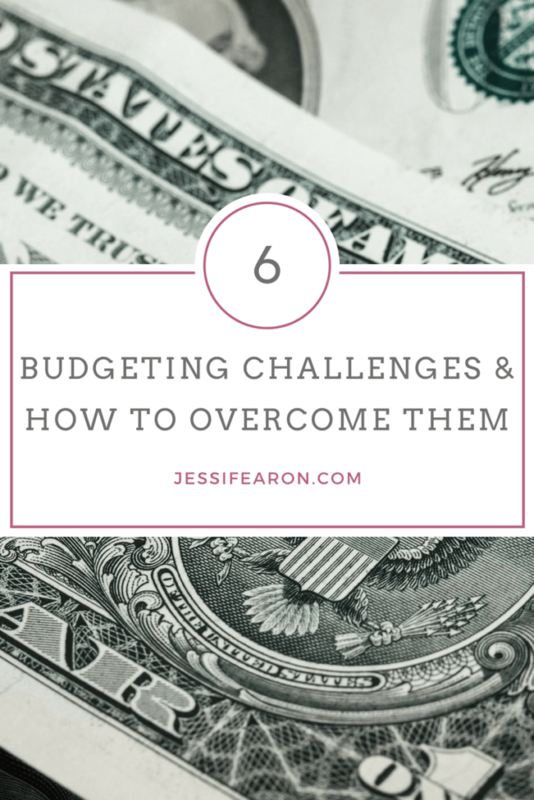 I’ve been budgeting for a long time and I can tell you that this whole “real life on a budget” thing isn’t without its challenges and obstacles. You’ll have seasons where your budget is working perfectly well and then you’ll have seasons where it feels like everything is just going wrong. And even though we can’t predict everything that will happen, there are some ways to overcome some of the most common obstacles to creating, sticking to, and living a real life on a budget. If you’ve never created a budget before head here to grab my free workbook to get your budget set up! Sometimes I think that when folks read my blog they just assume that my husband was always (or is always) on board with this whole budgeting thing. But the truth is that he hasn’t always been on board and there are many times when he’s still not on the same train as me. But here’s the thing – when you’re married, you agreed to doing life together and money is a pretty big part of life and how the two of you decide to manage it is a big deal. So, if you aren’t on the same page financially, here’s what you need to do – have an honest conversation – one where you don’t know the outcome. One where you two aren’t yelling and screaming but talking about real life and really hard stuff. I don’t know why, but this is really hard for most of us. We desire a deep connection with our husband or wife but we avoid really hard conversations like the plague. The only way to have a truly intimate relationship with your spouse is to actually open up and be willing to openly hear what your spouse has to say. For me, I’m the natural saver and my husband the natural spender. That made it super easy for me to make him a target when we first started actually trying to budget and pay off debt. I mean, it was so easy to point out that he was spending a ridiculous amount of money every month on a $2 can of RedBull! But it was hard for me to see that my husband didn’t like it that we’d have money sitting in a savings account and he’d need buy an expensive tool for work and I’d immediately freak-out and overreact and tell him we didn’t have the money. The thing is, in my husband’s eyes we did have the money – it was sitting in savings, so he couldn’t understand my reaction no more than I could understand why he couldn’t see how much money he was “wasting” on a $2 RedBull every month. The only way to overcome this was to have a real and honest (and albeit, hard) conversation about it. Compromises aren’t reached if no one is being really honest about where they stand. And the outcome of this conversations was our “funds” budgeting system. I know this area is challenging for most everybody, and if you find yourself dealing with this struggle, head here to read more about making these hard conversations a reality. 2. All work and no fun. This is probably the biggest obstacle to overcome when it comes to budgeting – giving up the “fun” stuff. And trust me when I tell you I totally 100% understand! When I started this whole “real life on a budget” thing I was deep in debt and single…and in my early twenties so giving up the night life of college was absolutely painful! But you know? I realized that by living a life by a budget, I was living life with more intention than I ever had before. I was forced to make hard decisions but they were decisions that were inline with my life’s goals instead of just whatever felt good in the moment. And that’s what happens when you start paying attention to your money – you realize that doing fun things is only really truly fun, when you have the freedom to enjoy it. When you know that you won’t have to stress over a low checking account balance come Monday and how you’ll pay the bills or a high credit card bill that you don’t know how or when you’ll be able to pay off. Not having to stress over those things, means that your fun gets a whole lot funner (yes, I know that isn’t a real word 😉 ). And guess what? You actually get more creative when you’re live life by a budget. You’ll take advantage of free things to do and discounts that you didn’t even know you could get. You’ll become more aware of your money and more willing to hold onto it and therefore, you’ll make better, more informed decisions. Ibotta – Free app for scoring cashback on most of purchases (especially groceries). Murphy’s Law…oh how I know this law all too well! Trust me when I tell you that it doesn’t matter how much money you make, if you’re in debt, or if you’re Bill Gates – Murphy’s Law will find you. But there’s no better way to make ol’Murph take a hike than to have a solid emergency fund set in place. There’s an amazing sense of peace that happens when you know that you’ve got a $1,000 or $2,000 or even $5,000 or more sitting in a savings account ready to keep your family afloat in case of emergency. Seriously, next to paying off all our consumer debt, having our 5 month emergency fund is an incredible source of peace! Since we’re a completely self-employed family this fund provides us with an extra layer of protection should anything happen to one of our businesses and allows us to keep food on the table and a roof over our heads. So if your big challenge to getting on a budget is how you’re going to deal with emergencies, I want to challenge you to let go of the “credit card” savior idea and start thinking about building up a cash savings account that can provide real relief during a crisis. Because let’s be honest, most folks that claim you need a credit card for emergencies somehow find a way to justify every little thing as an emergency. But when you have thousands of dollars of your hard-earned cash sitting in an account and something pops up, it forces you to ask “is this a real emergency?” and more often than not, it’s not a real emergency and is something that if you rework the budget you can make happen without touching your emergency fund. After working years of retail, I can attest to the fact that nothing, and I mean nothing brings out the crazy in folks quite like the holiday season. The season for giving and for caring for others turns into a nightmare inside the aisles of stores and even minds of folks. I’ve seen folks spend over $6,000 on junk (no, I’m not kidding…not even a little bit) – like I mean that whole “as seen on TV” junky stuff as “stocking stuffers” and they do this without blinking because “I’m going to get so much cashback/Skymiles on this purchase!”. When in fact they only earned $300 back on that $6,000 purchase but because of the disconnect between the money sitting in their checking account and the money they can borrow (i.e. their credit limit) they just swipe like there’s no tomorrow. Only problem is that there is a tomorrow and a bill that requires payment and most folks get to January going, “how on earth am I going to pay this off?” And most folks don’t even get that bill paid off before the next holiday season starts! It’s this never ending cycle and before long, they feel trapped. I know that this is an extreme example and most folks don’t spend that much on junky stuff, but many of us have and do spend way outside the limits of the cash sitting in our checking account just because we have a higher credit limit and we want to create special memories for our families during the holidays. Well, guess what? There’s a much better way to handle holiday spending and that way involves a budget and cash. Does that mean you might not be able to spend $6,000 on Christmas? Yes, but you know what – you’re going to feel a whole lot better about your financial situation come January when you don’t. Start planning for Christmas all year long – open up a savings or checking account designated for Christmas spending ONLY. And contribute a set amount every week or paycheck to that account. Then once Christmas time rolls around, you’ll know exactly how much money you have to spend. There’s no guessing and there’s no going over – the budget is set and you get to spend that money on whatever you need to. Want to make this the year you have a debt-free Christmas? Head here to sign up for our FREE 8-day email series and get started making this Christmas a debt-free one! 5. Feeling cheap or poor. I totally get this feeling. I can remember standing in the grocery store with my coupons (back before coupons were cool) and getting laughed at by other girls about my age because of those coupons. Trust me, I didn’t feel really awesome when that happened so I totally understand how this can sometimes hurt. But, I also know that living life on a budget doesn’t mean that you’re cheap or that you’re poor. In fact, being on a budget means you know exactly how much money you have and therefore you know what you can do with it. Every year since becoming debt-free we’ve taken a family vacation to the beach for a $1,000…as a family of five. Are we staying in a five star resort? Nope. But we’re making the most out of what we’ve got and we get to enjoy an amazing week at the beach without going broke. I know that our vacation might not be as exciting some others, but if we still had all that debt we wouldn’t be able to afford taking the vacation that we do every year. And gratitude is an incredible blessing and keeps those feelings of poor or cheap at bay. Probably the hardest thing when it comes to budgeting is making it fit your actual life. Sure you can follow the recommended percentages and stick to your budget but if your budget isn’t inline with your life’s goals, you’ll eventually burn out and quit this whole budgeting thing. So here’s what you do – the key to living a real life on a budget – is knowing where you want your money to take you. Always have a goal for your money. Always. Your dreams are probably big and money is probably a factor somewhere in those dreams and guess what? You’ll never get to live out those dreams if you don’t plan for them in your budget. Case in point, we always dreamed of sending our kids to Catholic school…which isn’t cheap and that dream has now become a reality. But it wouldn’t have been a reality if we hadn’t paid off our debt, built up a solid emergency fund, and made our budget for us. Of course your dreams are going to be different than ours, but I can guarantee that you won’t achieve those dreams if you don’t start making a plan for them. Okay so you tell me, what obstacles have you overcome when it comes to managing your money well?